we were deeply touched by the beauty and humanity of blog and journal days with my father. 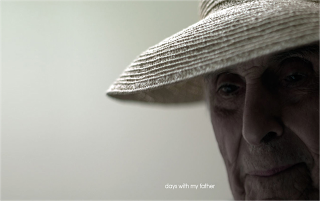 a son’s photographic journey of at once learning about and caring for his elderly father, it touched the heart of bras and ranties in both a deeply sad and deeply grateful place. how difficult the process of age and loss is, on both the subject and the audience. and yet how lucky we are to feel so deeply about another at all – the love of family like no other. how lucky we are to be loved. we don’t get to see our mum and dad all that much, their wanderlust and our dance card so often at odds. and yet in a brief drive by supper, we saw breathtaking photographs snapped by our mum as she travelled across india. we learnt our dad is going back to school to get a second masters degree in history, because it interests him. we watch our sister building her yoga practice – the very thing she loves most. we feel proud. we feel lucky. we feel blessed. take a moment to scroll through this soulful and moving piece. then call your mum and dad and tell them you love them. Wow. That was the most touching and emotionally moving 5 minutes I've had on the web in recent memory. Glad I had a box of Kleenex close at hand. Thanks for the link.